Rosehaven Cottage: Go ahead... don't be afraid... get creative! I've had such positive comments about my new self-created blog template that I decided to share my "secret"--Adobe Photoshop Elements. Now hold on... I can tell some of you are getting ready to phase out at the mention of the "scary" PHOTOSHOP! Not so fast... take your cursor away from the back button. Adobe decided a few years ago to offer a less expensive and less "scary" version of Photoshop to users that aren't graphics and photo professionals. What they created was Adobe Photoshop Elements. It has the best features of the full version without the hefty price or intimidating interface. The developers made effects, borders, and frames available with one click of a button so that digital scrapbookers, artists, bloggers, and photo hobbyists could enjoy the great effects without the time-consuming learning curve. A year ago, I got my copy of the software bundled with Adobe Premiere Elements (the scaled down version of their video editing software), and it cost me less than $100 USD (actually less than $50 USD with a sale and rebate combo I took advantage of). That took care of the first reason why I didn't have it. Once I got the software home and loaded on my PC, it was so user-friendly that I could navigate around without feeling intimidated. Just by poking around and playing, I taught myself the software. I ventured into my own projects and learned as I went (I learn better that way). After about a year of navigating my way around in Photoshop Elements, I recently ventured into the territory of its big brother/sister, Adobe Photoshop CS3. This week I've been immersed in self-training through book tutorials, CDs, online videos, and supplementary specialty publications. I'm so immersed that I'm dreaming in layers, palettes and menus. I still go back to Elements. Here I am immersed in training on the "Mac Daddy" of photo editing software and just today I went back to Elements to create a new desktop (wallpaper) image for my computer. Why I feel guilty, I'll never know... they're both Adobe products. I'm not "cheating" on anyone. with just a couple of easy clicks. So fun. So easy. So rewarding! Okay, have I convinced you to be brave and create? I hope so. It's easier than it seems. I just might give that a try! 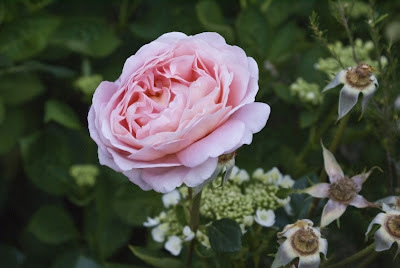 I do love Abraham Darby- what a perfect rose and it even smells good! I hope the smoke from the fires isn't making it to your part of CA. We have Photoshop Elements, too! My Mommie hates reading instructions, so she just figured it out by playing around. It's fun! That is a beautiful rose. I have just started using photoshop elements for editing my flickr and blog photographs. I'm having great fun with it - as you note, it isn't as intimidating as using the full version of Photoshop. Ah, Cindy, you have discovered the joys of PSE! I absolutely love PSE! It is my springboard in digi-scrapping. I know what you mean about dreaming in layers. I love the new look of your blog! I have to admit that after several years, I'm STILL learning Photoshop CS, without having first mastered even PS Limited Edition. I used to think I had to work and learn in progression, and "get" one thing before I moved on to the next. Now, being maybe just a bit smarter about it, I simply wing it. One way we all intimidate ourselves is by thinking we have to get it perfect, or get the whole thing, or learn in a prescribed order! True -- some of the fanciest stuff is one- or two-button simple in PSE. I know just enough to be dangerous. I love that pink rose!! I need to work with my photoshop more, but just haven't taken the time yet. Hope you are safely away from all the fires. One of these days...I'll save my pennies and get it. I learn better by doing, but it has to be super user friendly or I just give up and quit. It's time I learned to use Photoshop! I still think you are brave dabbling in the teckie side. It fills me with fear. I have tried something new recently- Flickr to put up pics of my Summer Stash Challenge things. Love the coneflower pic- I grew some from seed years ago. I did buy it a while ago, but I have not had time to try it....I love that rose! What fun to be creative! Your Abraham Darby rose is so pretty. I`ll buy PS elements when I go to SLC in september. I have no clue how to use it but I have 120000 photos on 2 external harddrives - I do not have much computerskills, but know A LOT about roses! Your new layout looks very nice. I really enjoyed this post. You and I are alike in our approach to Photo Shop. First and most important: Make a copy of your photo. After that just do whatever... Select every filter. Slide every slider. Indulge every whim. You can do no harm when working with a copy. Sometimes the accidental results are very nice. You learn as you play with the software.